Erected 1969 by Manzanita Parlor No. 29, N.D.G.W and Quarts Parlor No. 58, N.S.G.W. Location. 39° 13.118′ N, 121° 3.782′ W. Marker is in Grass Valley, California, in Nevada County. Marker is on Mill Street south of West Main Street, on the right when traveling south. Touch for map. Marker is at or near this postal address: 116 Mill Street, Grass Valley CA 95945, United States of America. Touch for directions. distance of this marker); Loutzenheiser Pharmacy Building (about 300 feet away, measured in a direct line); Three Stamp Mill from the Red Ledge Mine (about 300 feet away); The Old Post Office (about 400 feet away); Madison Lodge No. 23 F. & A.M. (about 500 feet away). Touch for a list and map of all markers in Grass Valley. 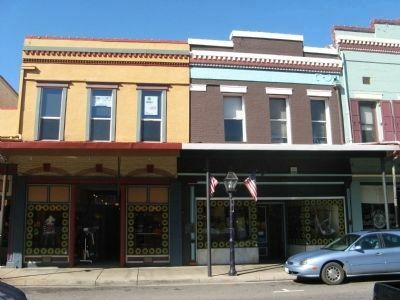 Odd Fellows Hall and Grass Valley Hardware - Built in 1855, the hall in this three-building complex was first known as Parker's Hall, named after builder and merchant John Parker. One of the buildings housed Grass Valley Hardware Co. for more than a century, until the company closed in 1989. 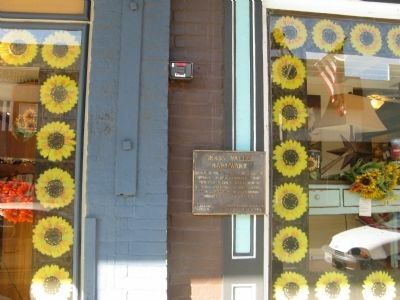 The Union newspaper began on the second floor of the Grass Valley Hardware building until 1864. The third building served as a bakery, grocery and dry goods outlet. Today the buildings house various shops. Marker is seen in the center of the photo between the two buildings. The Grass Valley Hardware building is the one on the right behind that street light and American Flags. More. 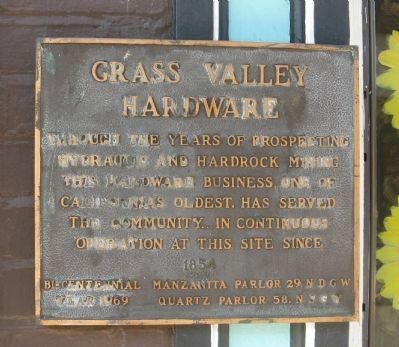 Search the internet for Grass Valley Hardware. Credits. This page was last revised on August 12, 2018. This page originally submitted on October 11, 2011, by Syd Whittle of El Dorado Hills, California. This page has been viewed 405 times since then and 6 times this year. Photos: 1, 2, 3. submitted on October 11, 2011, by Syd Whittle of El Dorado Hills, California.